The line was quite long right before 1pm, but moved rather quickly. So excited, we’ve been waiting the whole morning. I was on a lobster withdrawal ever since my last lobster fix (in Maine). 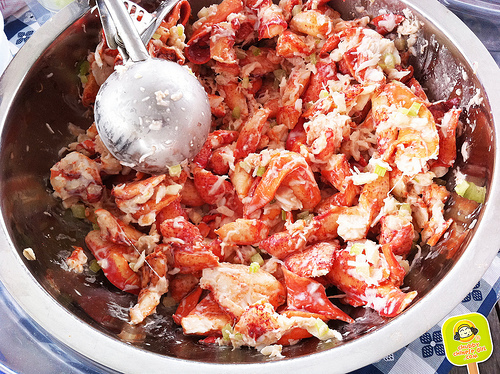 A generous amount of lobster in every bite. Fresh lobster is so sweet and bouncy. Love it! Lightly dressed in mayo, a sprinkle of lemon, chopped celery for texture and chives brighten it up. There’s some shredded lettuce on the bottom . A dash of paprika on top and voila. Simple, yet so good. A little pricy for lunch, but I’m willing to pay for lobster that’s traveled all the way from Maine to my tummy. Yes, I’m totally hooked. 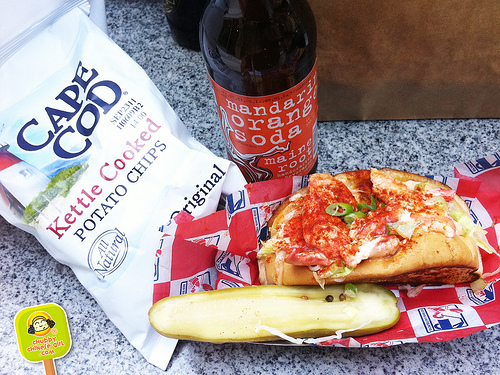 I think this is the best lobster roll in NYC. Oh, the roll itself is not to be overlooked either. The original Maine lobster roll bun from JJ Nissen is drenched and soaked in butta’ ohhhhh, this would make Paula Deen drool y’all. Last year, I caught them at the Brooklyn Bridge. Summer time, lobster roll and a million dollar view made my weekends even better. This year I caught them at the Williamsburg Waterfront on the weekend (part of the Brooklyn flea). 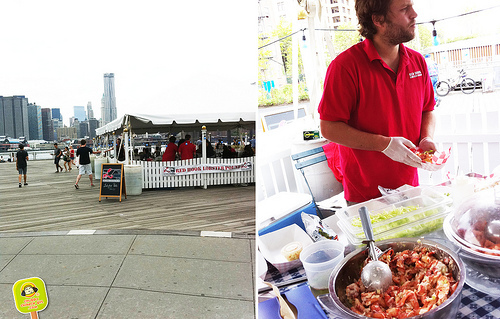 Now that they have a mobile truck, they’re bringing lobster all over the city, so track’em down and treat yourself. 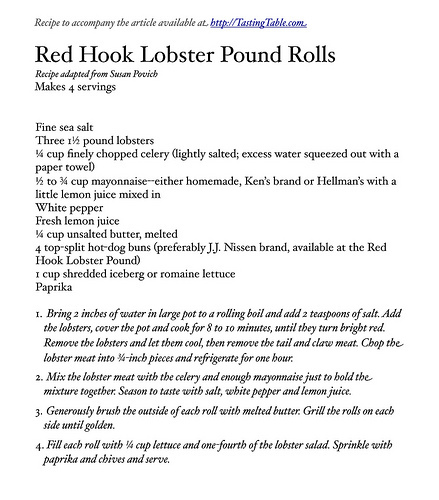 If you can, go to their Red Hook Lobster Pound and have a whole lobster dinner for $25! yum! lobster pound is my fave! and kudos for uncovering their secret recipe! thats awesome!! Lobster roll is a simple yet satisfying meal for lunch. 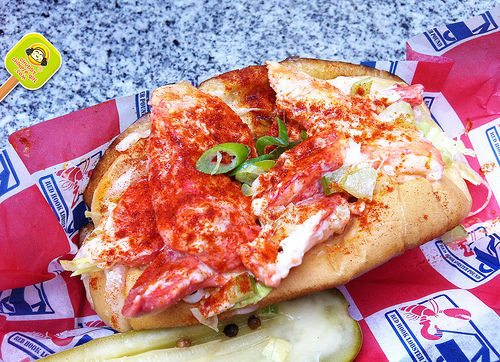 There's a new "Lobsta Truck" in downtown L.A. that serves delicious seafood sandwiches such as Lobstra Rolls, Crab Rolls, and Clam Chowder. Each costs less than $10. 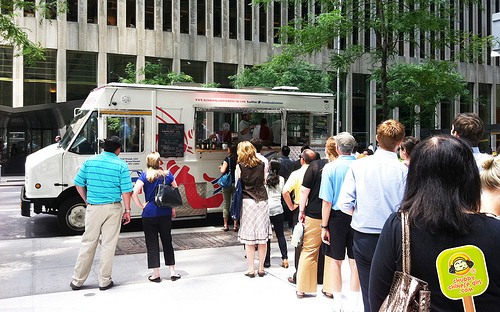 These food trucks in NYC are perfect in giving your better, far more vast choices of dishes. Also, at a cheaper cost, you'd get a gastronomic treat with different ethnic specialties offered on the go. 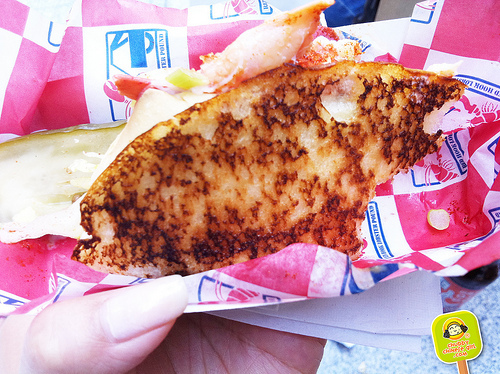 The wide array of choices of different origins makes food trucks a delight in casual on-the-go dining. 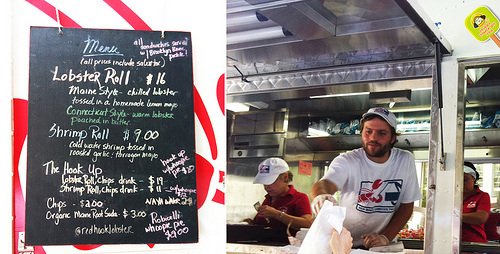 This lobster truck definitely serves delicious food. My wife and I tried it once and we keep coming back whenever we have a chance to see it. Rolling around and making people happy- food trucks are the ice cream truck equivalent for adults. They have so many patron waiting in line just in time for their lunch. Wow! I want to taste their foods too.